2/8th Bn, The Worcestershire Regiment, 182nd Brigade, 61st Division, T.F., B.E.F. 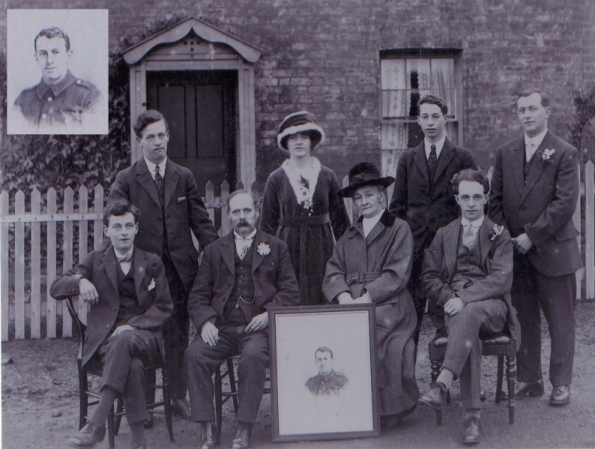 Roland Monk was born at Malvern on 24th February 1897 into a musical family. He was an adult member of the Malvern Church Lads Brigade. 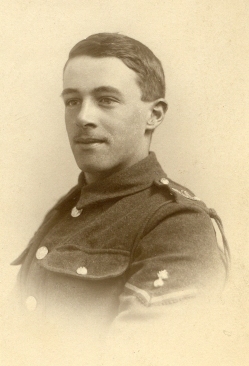 He joined the 8th Worcestershire Regiment before the war, and signed up to serve overseas, but for reasons unknown was kept behind with the second line battalion, later to become the 2/8th Worcestershire Regiment. In 1914 he lived, with his parents, at Edith Cottage, Moorlands Road, and was a regular worshipper at Malvern Link Free Church (today’s Malvern Link URC). After moving round Britain, to places such as Northampton, Chelmsford and finally Salisbury Plain, Monk embarked with the 2/8th Worcesters for France, and landed at Havre on 25th May 1916. The above picture shows that he was a qualified bomber. Winter 1916 found the Battalion on the Somme after the campaign begun in July had ground to a halt. The 61st Division to which the 2/8th Worcesters belonged had taken over part of the line on the Ancre Heights, near Thiepval. The Battalion took over the trenches on the slopes of the valley of the Ancre in darkness on the evening of 30th November 1916. His brother, Bernard, who served with the Gloucestershire Regiment stated that Roland had been wounded before reaching the line, this cannot now be verified, but as his brother’s battalion served in the same Brigade it seems likely that this is accurate. The total number of casualties for the period 1st – 6th December were 8 men killed, 2 officers and 12 men wounded. Roland Monk who was evacuated and died of his wounds the following day. He was buried in Dernancourt Communal Cemetery Extension which was the site of the XV Corps Main Dressing Station and was only a few miles behind the front line. 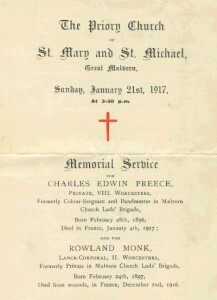 His death was reported in Malvern during the second week of January 1917. 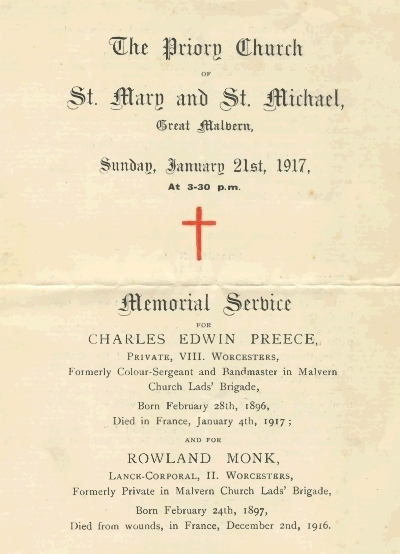 A memorial service was held for him at Great Malvern Priory and another former member of the Church Lads Brigade, Charles Edwin Preece on 21st January 1917. At this service Psalms 15 and 25 were sung, the lesson was taken from the Chapter 21 of the Book of Revelations, prayers were said for the fallen, the congregation sang the hymn Ten Thousand Times Ten Thousand, In Sparkling Raiment Bright and the service concluded with the Blessing and the singing of the National Anthem. The war memorial at Malvern Link C.E. School incorrectly commemorates Roland’s brother Edwin as having lost his life in the Great War. Edwin actually lived until 1957. In 1921 Roland’s sister Ina married – this touching group photograph shows that his life had not been forgotten by the family. Edna Monk 2004 and 2005.